(a) Engage the front door front window frame moulding to the door frame. (b) Using an air riveter or hand riveter with a nose piece, install the front door front window frame moulding with 2 new rivets. 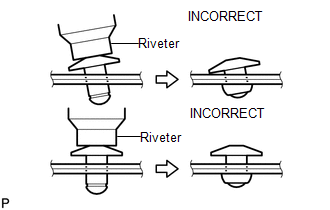 Tighten the 2 rivets in the order shown in the illustration. (a) Engage the guide and front door upper window frame moulding to the door frame. (b) Using an air riveter or hand riveter with a nose piece, install the front door upper window frame moulding with 6 new rivets. 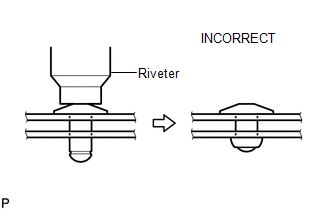 Tighten the 6 rivets in the order shown in the illustration. 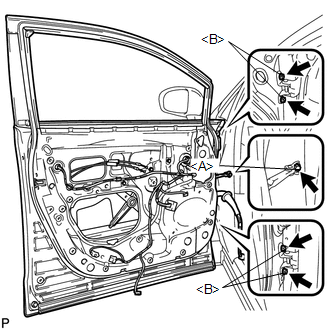 (a) Install the front door panel sub-assembly with the 4 bolts <B>. To prevent damage, when installing the front door panel sub-assembly, make sure that there are enough people available to hold it securely. 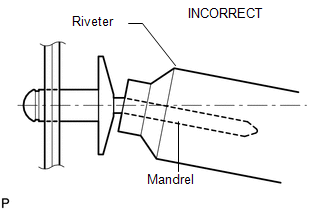 (b) Apply adhesive to the threads of the bolt <A>. 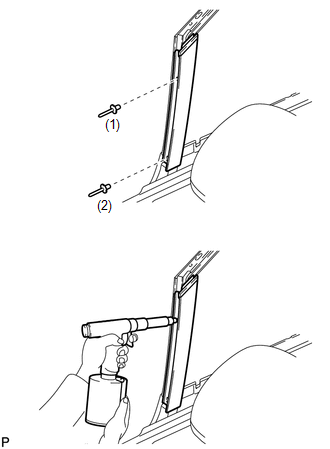 (c) Engage the front door check assembly with the bolt <A>. 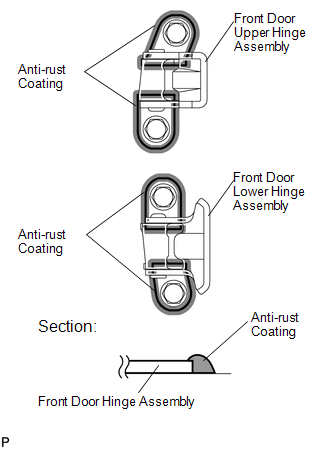 (d) Using a brush, apply anti-rust coating to the front door hinge assembly as shown in the illustration. When installing the front door rear window frame moulding, heat the vehicle body and front door rear window frame moulding using a heat light. 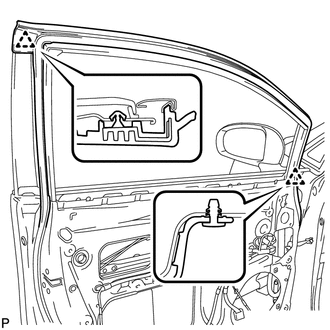 Do not heat the vehicle body or front door rear window frame moulding excessively. (b) Clean the front door rear window frame moulding (if reusing the front door rear window frame moulding). 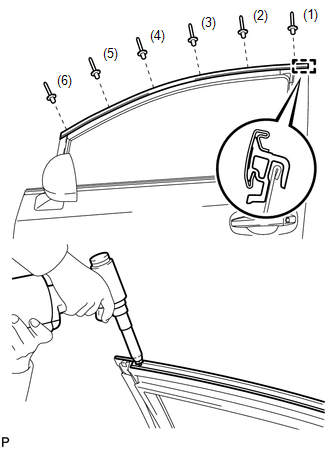 (1) Using a heat light, heat the front door rear window frame moulding. 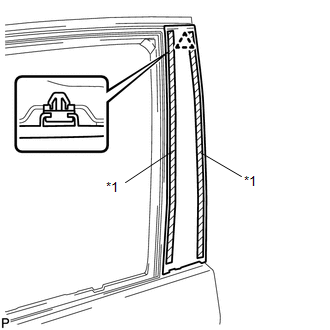 (2) Remove the double-sided tape from the front door rear window frame moulding. (4) Apply new double-sided tape to the front door rear window frame moulding. (c) Install the front door rear window frame moulding. 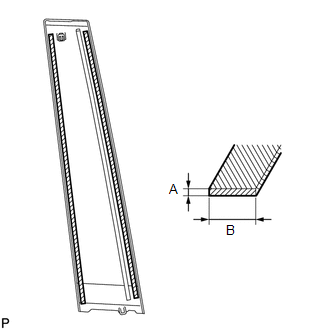 (1) Using a heat light, heat the vehicle body and front door rear window frame moulding. (2) Remove the peeling paper from the face of the front door rear window frame moulding. (3) Install the front door rear window frame moulding with the clip. (a) Engage the 2 clips and connect the front door weatherstrip.